Over the past few days we have eaten a lot of stuffed pumpkin. The thing about stuffing a pumpkin, even a small one, is that it provides you with about eight meals. So the takeaway is this: make sure you really like stuffed pumpkin before you make it. 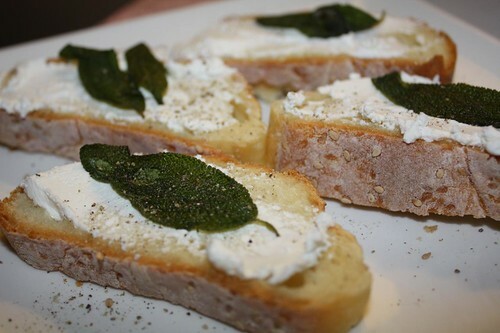 On Tuesday, whilst Jen hobnobbed with various celebrities, shoe designers, and celebrity shoe designers, I enjoyed some crostini with goat cheese and the leftover fried sage leaves form the other night. 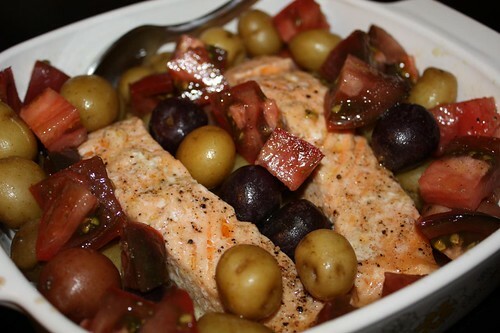 Tonight I had about fifteen minutes so I "roasted"* some salmon and served it with boiled potatoes and sliced heirloom tomato. The potatoes were the tiniest I've ever seen and we picked them up this weekend in Katonah, compelled almost exclusively by their miniature size. * Okay, I actually just did the salmon in the microwave. Time was of the essence and microwaves have their applications, particularly in the cooking of fish and baked potatoes. Don't look at me like that. There's nothing wrong with me. I'm a good person! 2.) Hollow out the pumkin, rub with olive oil, salt, and pepper, and roast until it becomes tender. At 325 degrees. 3.) Sautee some garlic, onion, and fennel in a pan until the onion is transluscent. 4.) Remove some sausage from casing (I used sweet Italian). and brown in pan with onion/fennel/garlic. 5.) When sausage is fully cooked I added the chard (you could use another green or omit all together) and cooked it down. 6.) Season with a little salt, and pepper, and add some fresh chopped sage. 8.) Add cornbread to sausage mixture until it absorbs a lot of the juices. 9.) Fill pumpkin with stuffing and pack it fairly tight. 10.) Return pumpkin to oven and finish roasting for another 20-30 minutes or until stuffing is done. I usually add the stuffing while still hot so it takes less time.